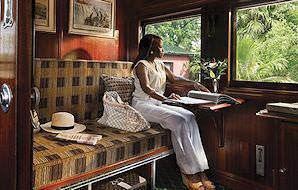 A host of plush suites are available on the Rovos Rail and Blue Train, each ensuring your utmost comfort and enjoyment. 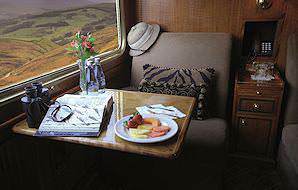 At 16 square meters, the Royal Suites are the most spacious of the Rovos Rail's accommodation options. 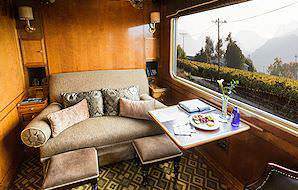 In fact, they each take up half a carriage, and boast both a private lounge area and full bathroom with Victorian bath and separate shower. The sumptuous suites are elegantly furnished and designed, with handsome wood paneling and stylish decor. The Deluxe Suites provide mid-range accommodation with 10 square meters of privacy to enjoy. They also offer a private lounge area, though it is somewhat more intimate in size. The en suite bathrooms have showers and include amenities like hair dyers and shaver plugs. Various configurations are available to make the suite as comfortable and complementary to your needs as possible. The smallest of the suites, the Pullman Suites are equipped with comfortable sofa seats that convert into a double bed or twin 'bunk' beds in the evening to ensure enough legroom during the day and absolute comfort in the evening. All Pullman Suites are en suite with showers only. They are fitted with most modern amenities, from hair dryers to bar fridges with drinks of your choice. 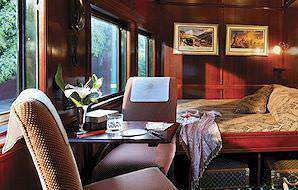 The Blue Train's Luxury Suites are the largest of the suites, 5,13 by 2 meters in extent. The comfortable sofa converts into a double bed or twins beds during the evening. Each suite has a private digital interactive entertainment system, with a selection of CD's and DVD's, as well as complimentary WiFi. All Luxury Suites have en suite bathrooms with bathtubs only. At 4 by 2 meters, the De Luxe Suites are more intimate. Only one of the De Luxe Suites can be configured into a double bed (this suite also has a 3/4 bath with a hand-held shower). The remainder are twin share with showers only. Various electronic entertainment options are on offer, as are comfortable amenities like individually-controlled air-conditioning and underfloor-heating. South Africa is a captivating country on the tip of the African continent. Botswana's collection of conservation areas leaves travelers spoilt for choice. Travel to Namibia for thrilling desert excursions and premium game viewing in Etosha. Zambia is known for Vic Falls and remote safari areas like South Luangwa. Our vacations to Zimbabwe typically include a visit to the famous Victoria Falls. Mozambique's immense coastline hosts some of the continent's finest beaches. A golfing adventure in South Africa can comprise an incredibly wide variety of destinations, from Cape Town and the Garden Route to Kruger and Sun City. There is no finer family vacation destination on the continent than South Africa. Have a look through our itineraries to whet your appetite. 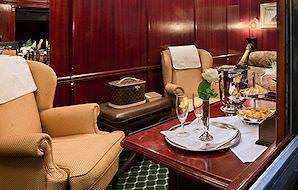 Relish unwinding in the lap of luxury while also enjoying safari activities in areas as diverse as semi-arid Etosha National Park and the verdant Okavango Delta. Relax on pristine, sandy beaches, scuba dive in bewitching coral reefs or observe a wealth of marine life on our unforgettable beach vacations.